(Click on PHOTO to enlarge and then hit the back arrow to return to original size). I hope you are all having a beautiful beginning of Spring, even though here in the Northeast we had a little snow on the first day of Spring to say our final good bye to Winter. Holy Week is such a busy time, we were all getting ready for Easter and baking our traditional breads and pies. 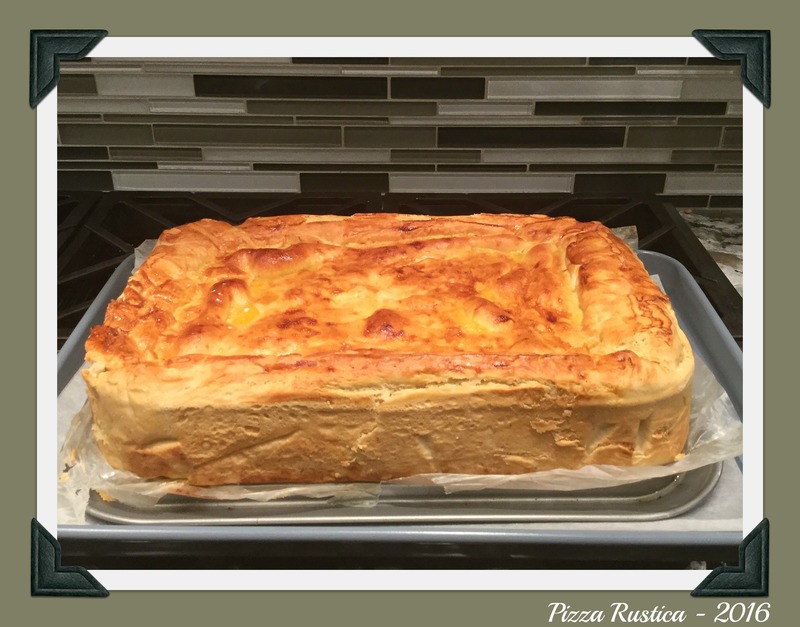 I have posted my family recipes for Pizza Dolce (sweet pie) and Pizza Rustica (meat and cheese pie) at the end of the post. Easter is a little early this year and Palm Sunday seemed to sneak up on us right after we celebrated St. Joseph’s Day. 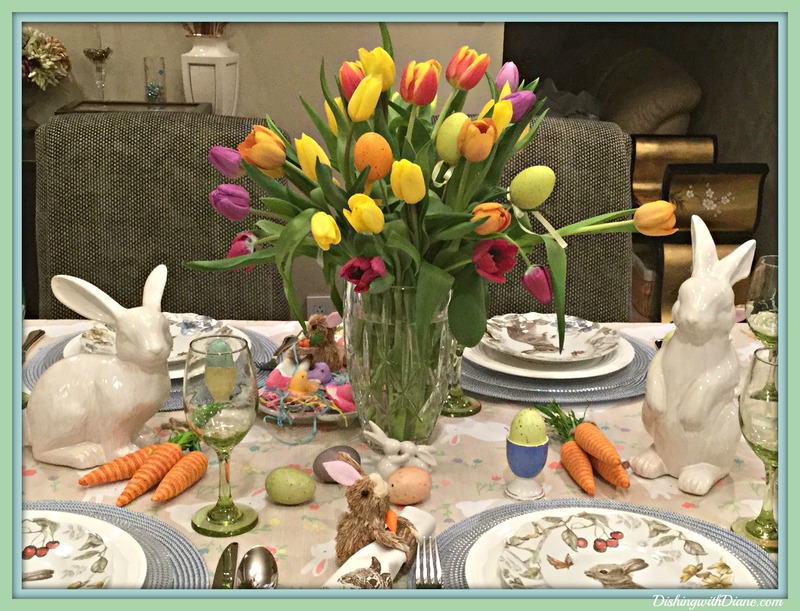 Still having a very busy month of March, so my Easter table is a lot simpler for me than last year. 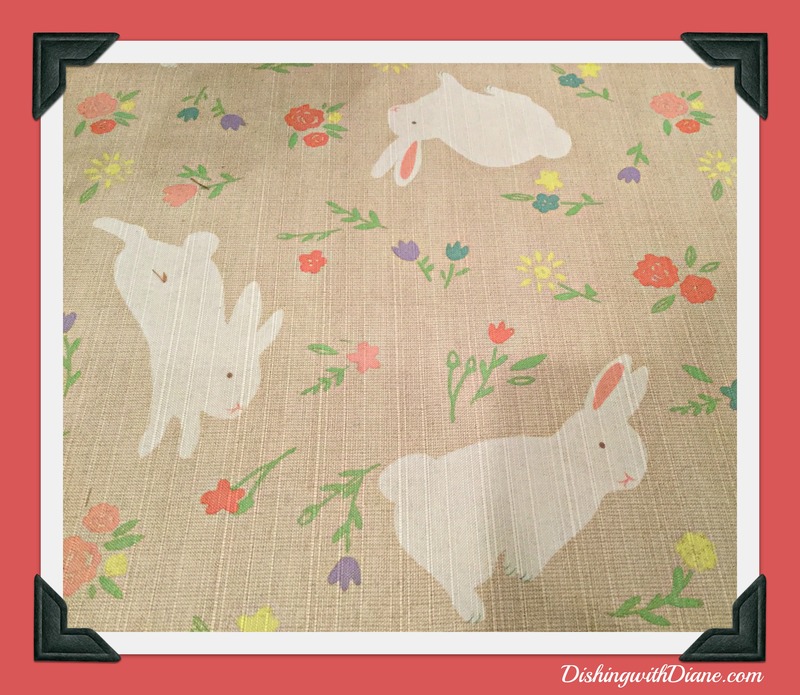 I am starting out with the cutest tablecloth; it is a white bunny and pastel floral printed design on a natural beige background. Now for the dishes. 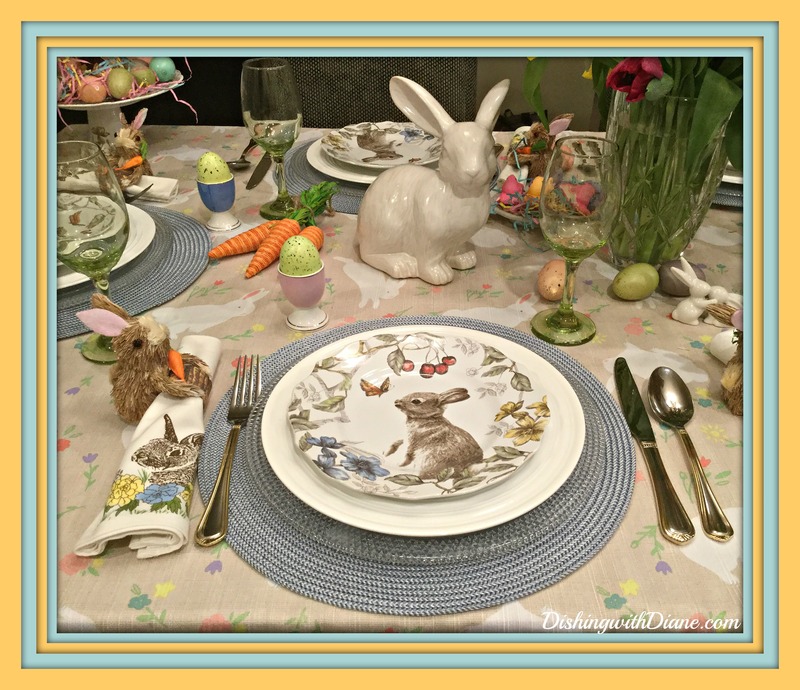 I loved the combination from last year of the white dinner plate and the star of our show, “Sofie the Bunny” salad plates from Pier 1. 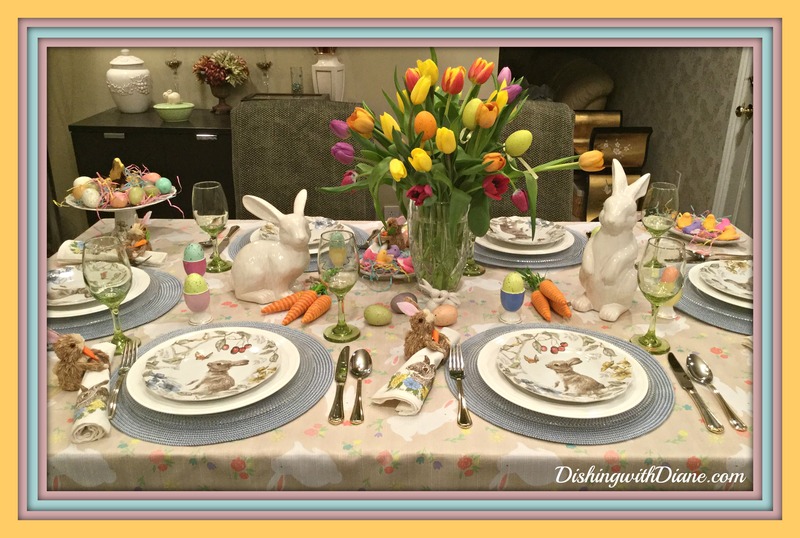 The plates have soft shades of yellow, blue, red, orange and brown surrounding “Sofie the Bunny” along with flowers and butterflies with a beautiful scalloped edge to the plate. 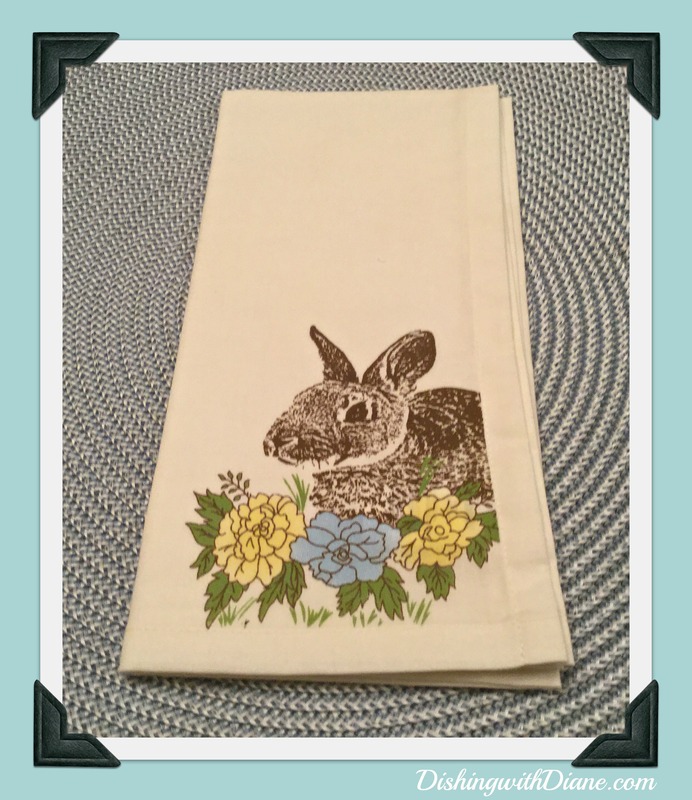 While shopping for a few table accents, I saw bunny napkins that I thought would add to my “bunny theme” perfectly. 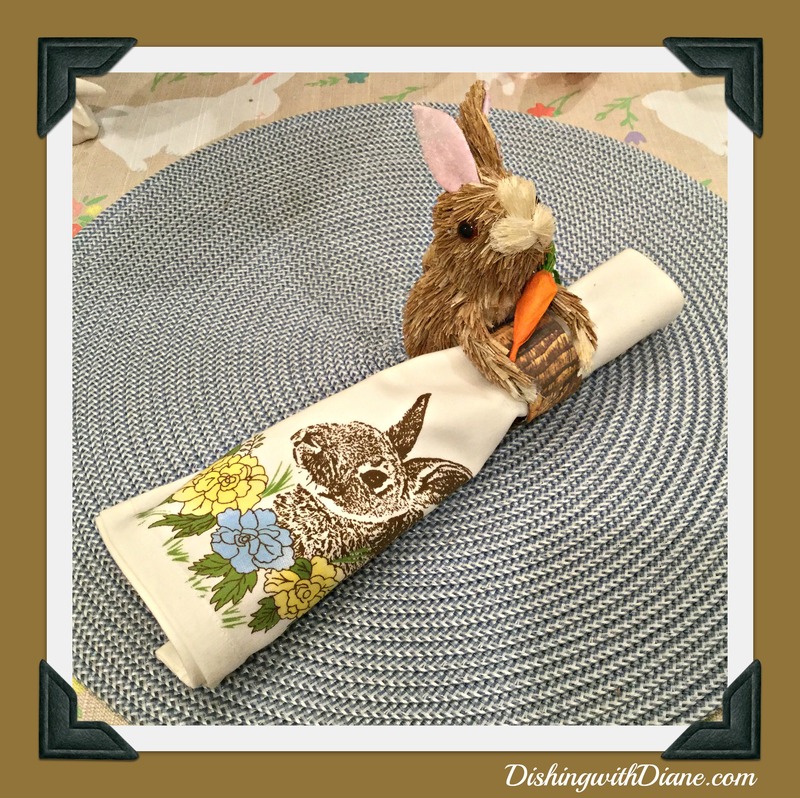 I also spotted sisal grass “bunny” napkin rings. 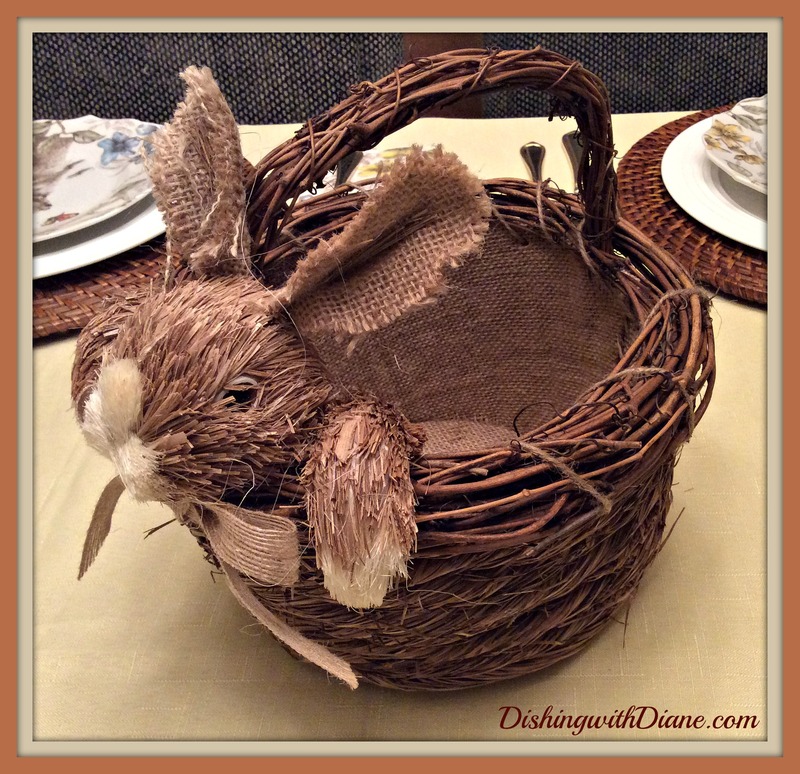 Originally, I wanted the napkin rings to match the sisal grass basket from last year (pictured below) and at the last minute decided not to use the basket for this years table. I am keeping this year pastel. But of course, I bought the napkins rings anyway. 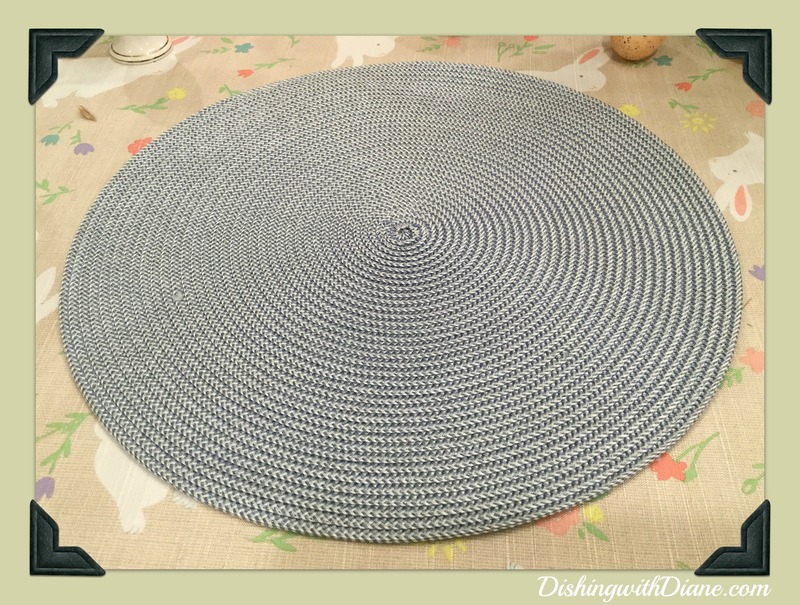 I am using pastel blue woven placemats since I wanted to keep everything very soft while still picking up a color from the salad plate. I chose glass chargers so the chargers wouldn’t interfere with any of the colors on the plate. 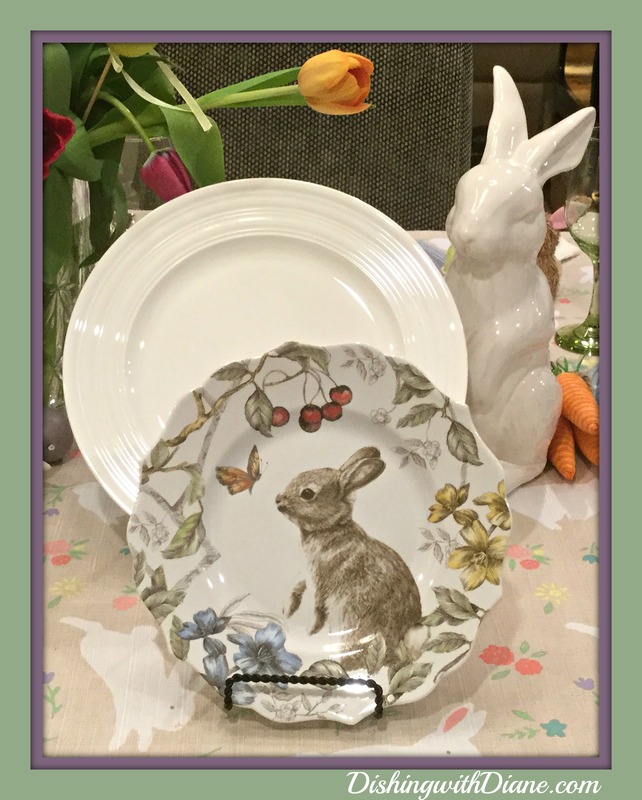 I added to my “Sophie the Bunny” collection this year and purchased two cake plates in the Sophie the Bunny pattern. 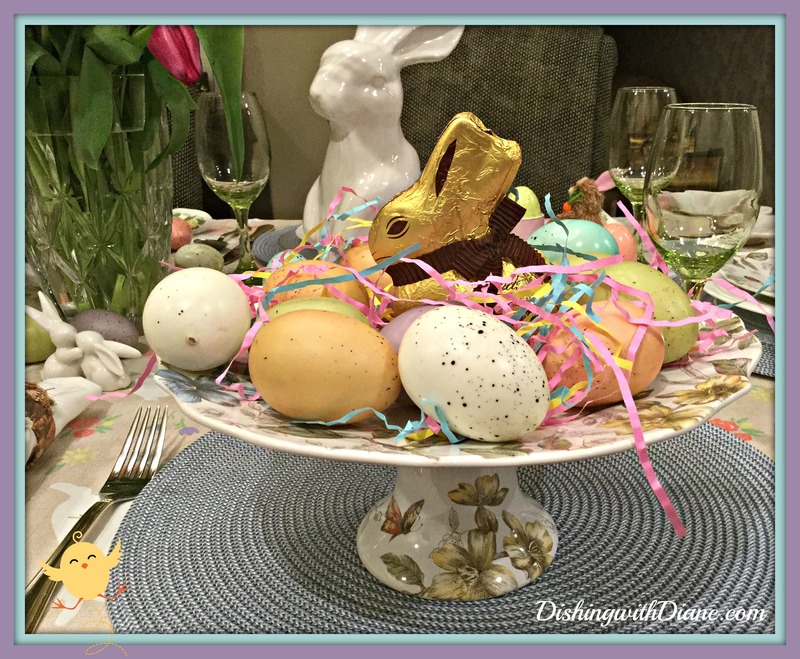 I am using one to display Easter eggs and chocolate and the second one will be for the traditional Easter bread, “Colomba Di Pasqua”. Colomba Di Pasqua is a yeast bread shaped like a dove (colomba in Italian), the symbol of peace and resurrection. It is similar to a Panettone and filled with raisins and candied orange peel. Topped off with almonds, sugar and baked on almond icing to give it a sweet crust. In my family, we would always have Colomba for breakfast on Easter. My mother would buy the traditional classic flavor but I have branched out into buying the Colomba with chocolate chunks added. 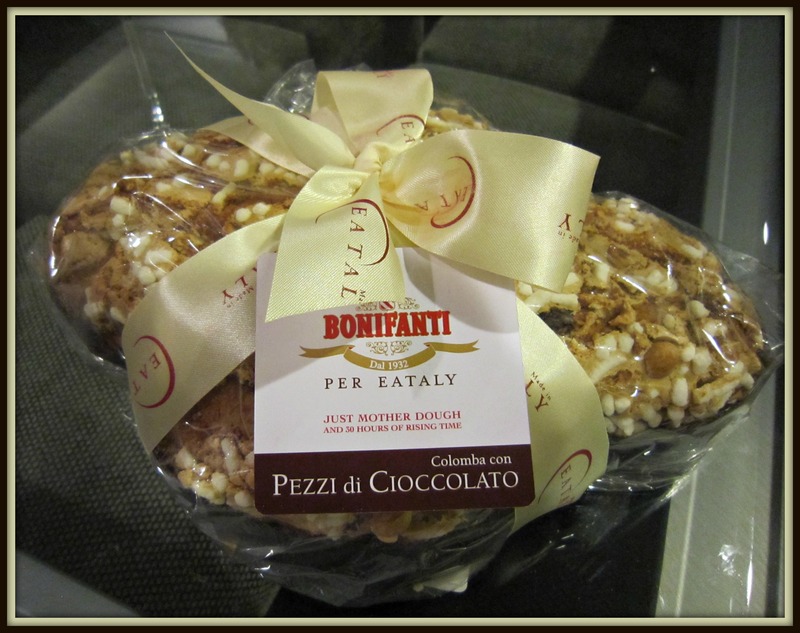 I find that the Colomba from the Bonifanti company is by far the best. 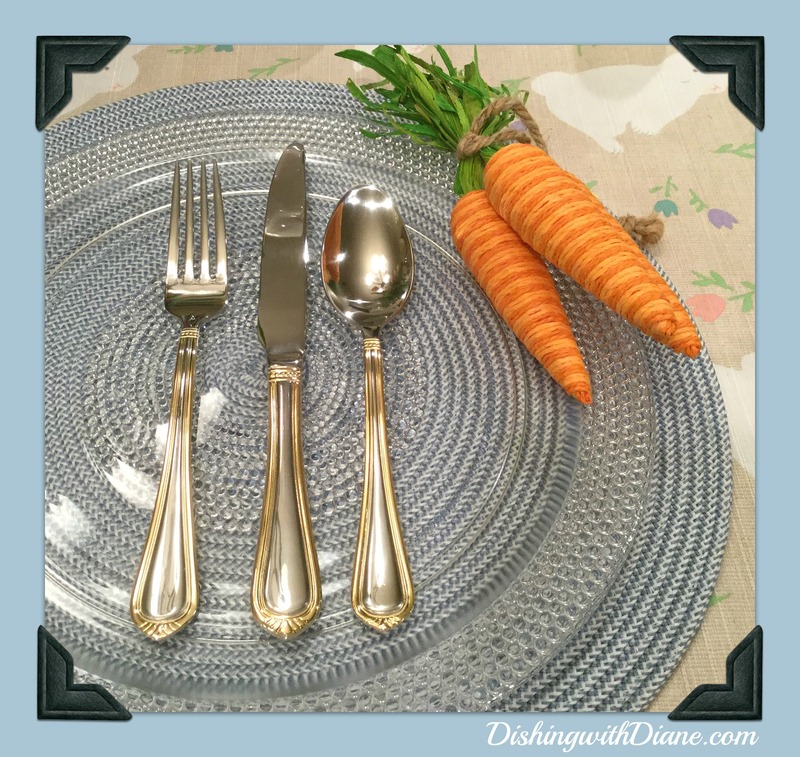 The flatware is my favorite everyday set in gold and silver. I am using light lime goblets to add to the pastel theme and pick up yet another color in the salad plate. 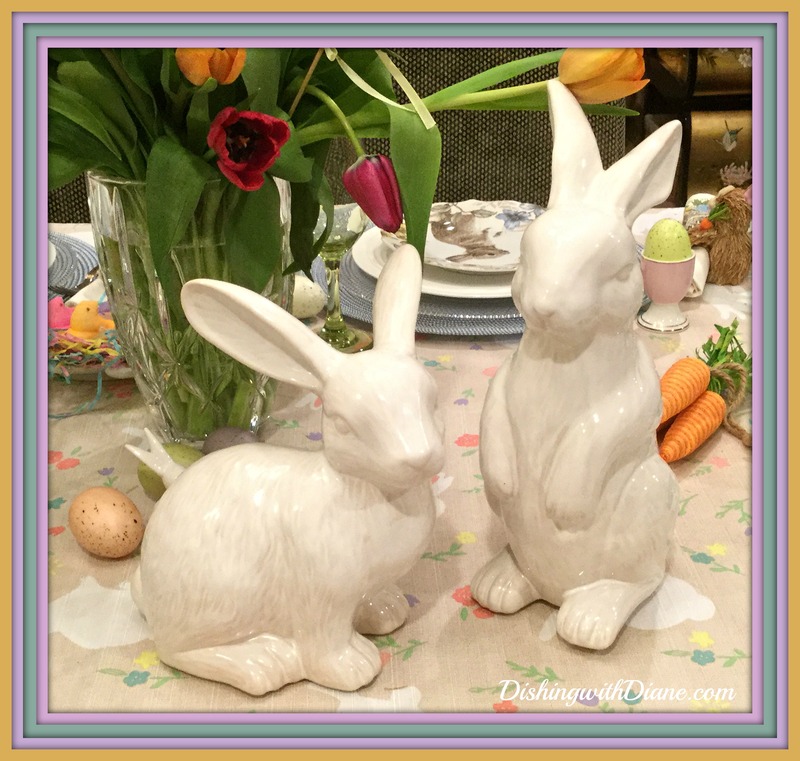 Every year on my table, no matter what the theme I choose, dishes or tablecloth I use, my two white ceramic rabbits will always be added to my tablescape. It has become somewhat of a tradition for me to include them. 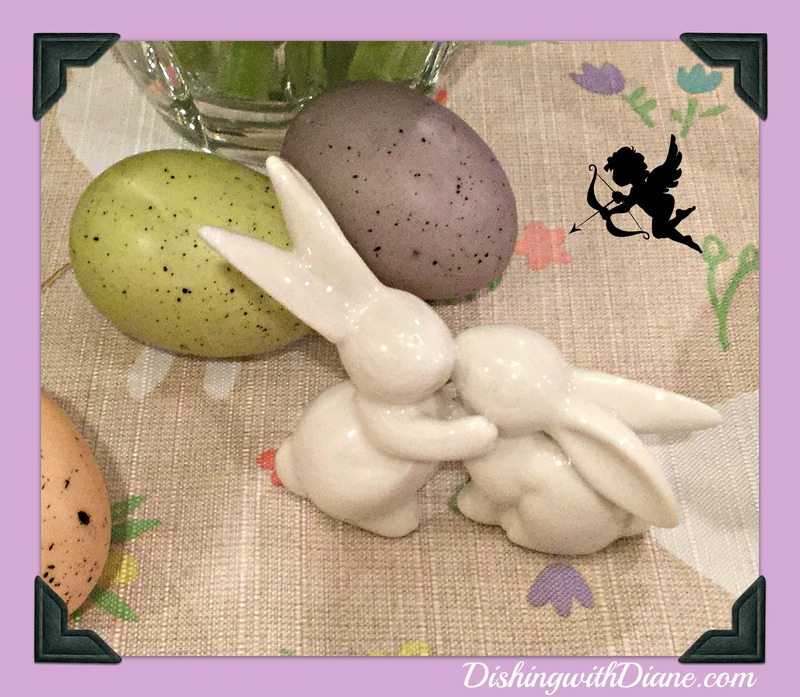 Last year I bought more ceramic bunnies for the table, and they are little “love bunnies”. I think I will add them every year as well; they are just too cute. Here is the description and card that came with them. 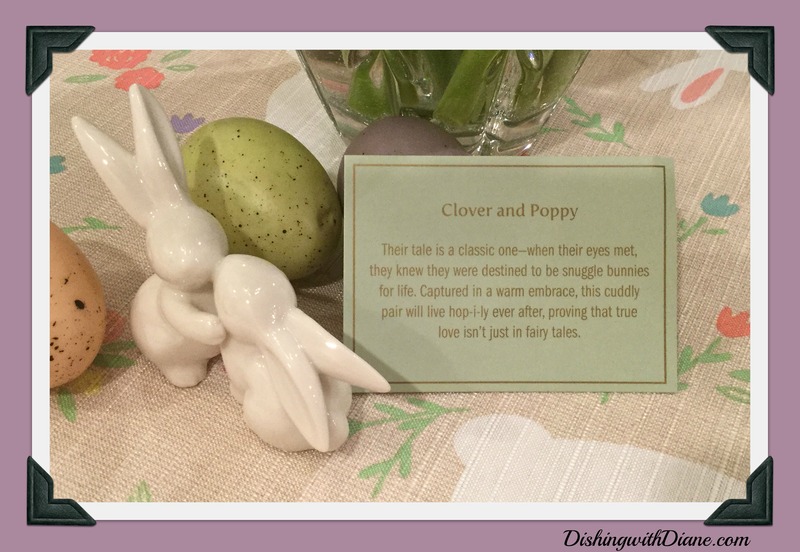 Since there are so many bunnies on the table this year, I thought that it would be cute to add a few table accents of carrots. 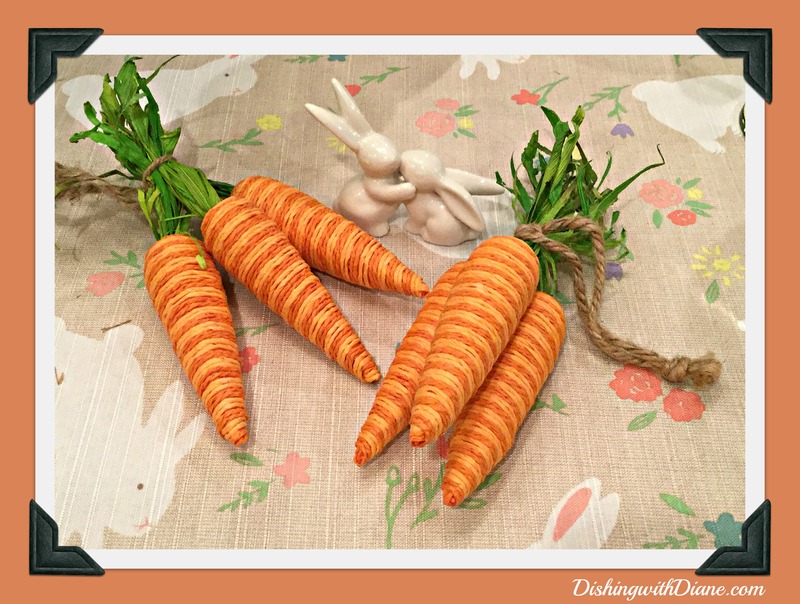 I bought these cloth carrots tied in small bundles and placed each trio near my white ceramic bunnies. 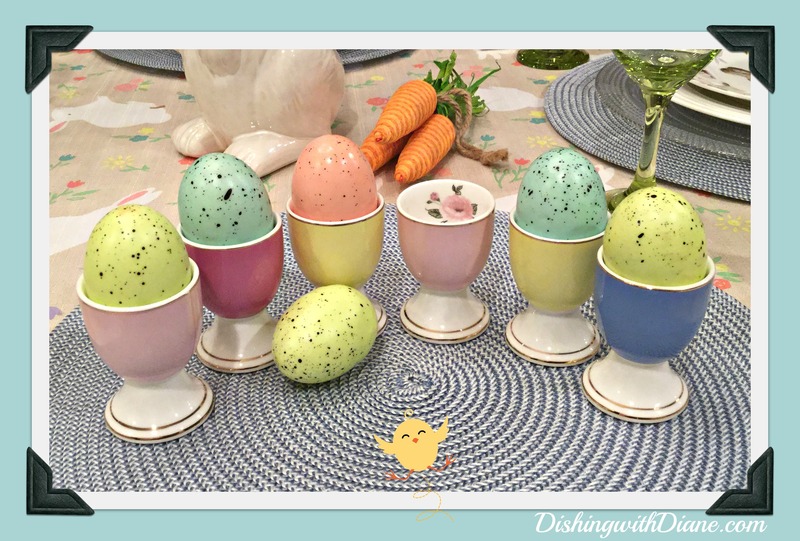 Adding to the pastel color scheme, I chose pastel egg cups that pick up even more of the colors in the salad plate. My husband bought me these egg cups as a no special occasion gift and I just love them (and my husband too of course). He has become quite the shopper over the years when it comes to tableware. Each cup has a delicate flower painted inside. 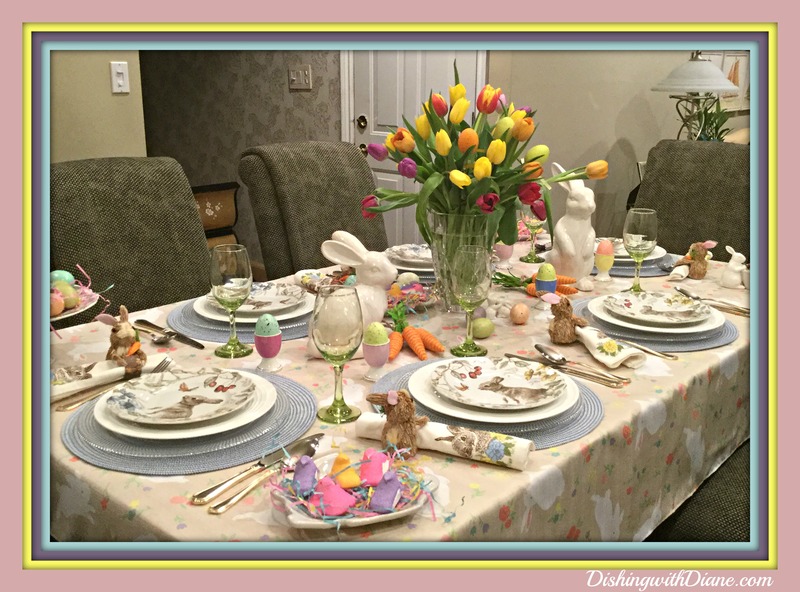 I am using artificial speckled foam eggs for each place setting. My centerpiece is very basic; a large bunch of assorted colored tulips. Nice, bright and it just says Easter and Spring. I have displayed them in my favorite Waterford vase. And for me, Easter just wouldn’t be Easter without my favorite confection, ” PEEPS”. 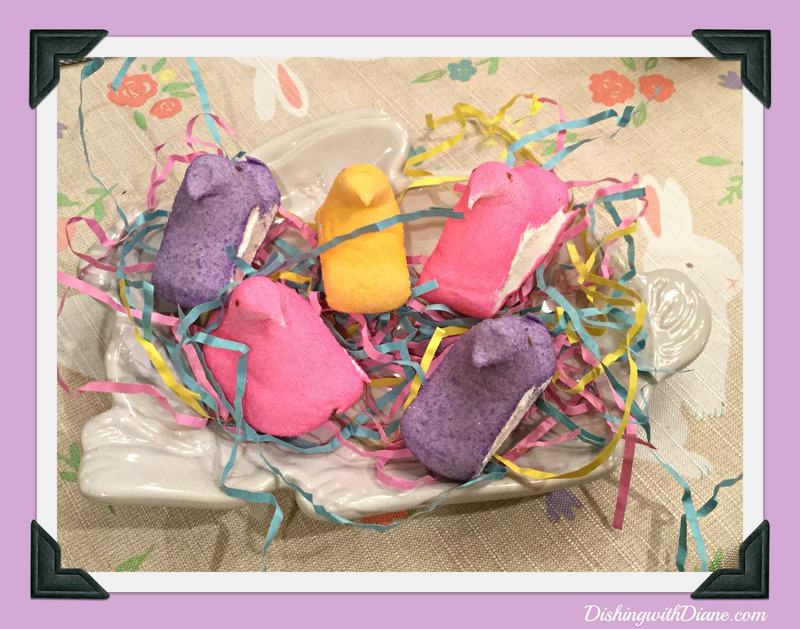 Peeps was the “first” candy I looked for in my Easter basket as a child and I have to buy them each year. Have to admit, I enjoy them more when they are a little stale. 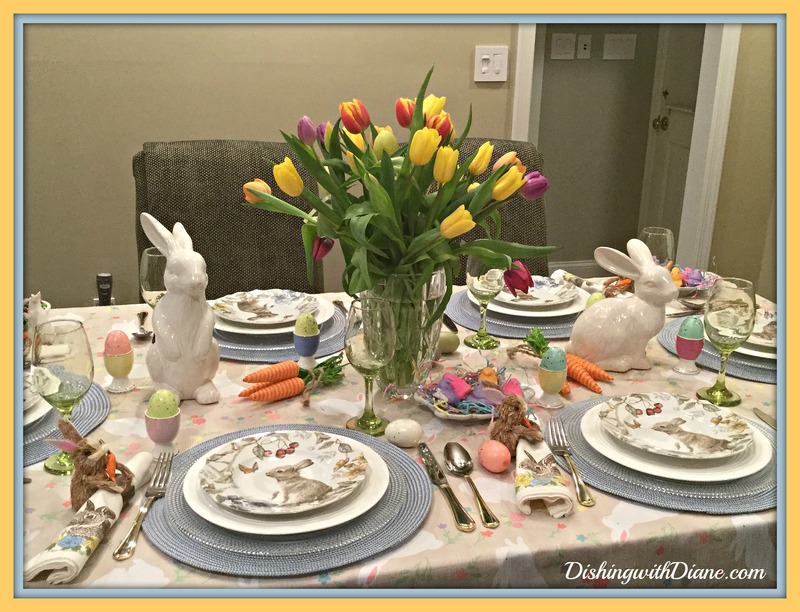 I am displaying Peeps around the table this year on a different set of white ceramic salad plates that are shaped like, what else? A white bunny. 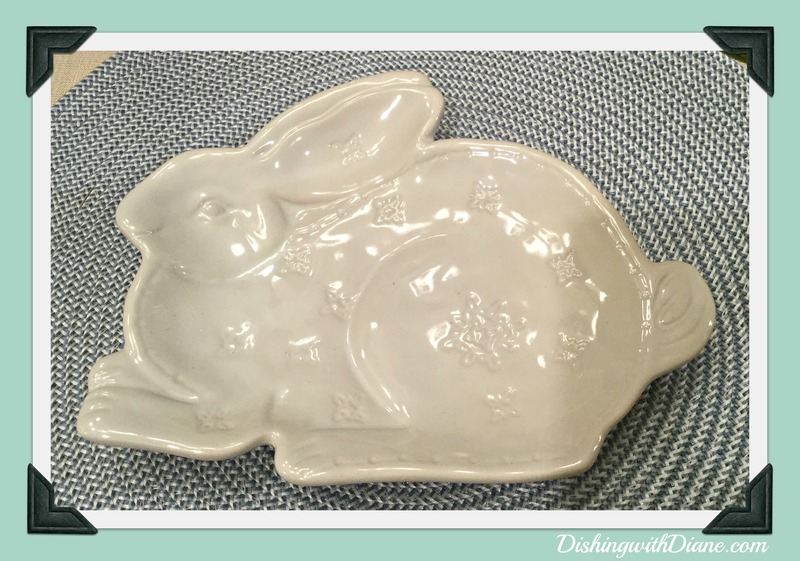 The last addition to my table is a white ceramic bunny candy dish. 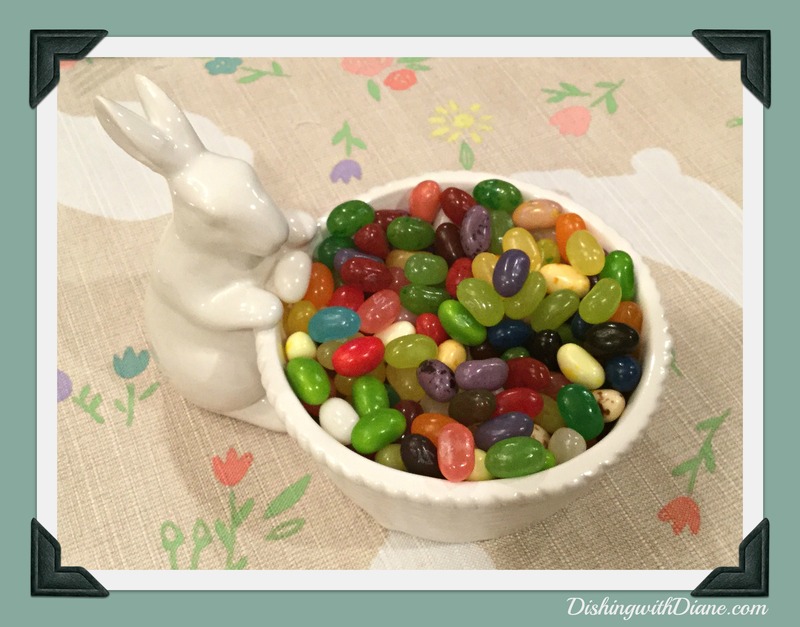 I made a promise to myself not to fill the candy dish with jelly beans until Easter Sunday. There are too many goodies in the house for this holiday. 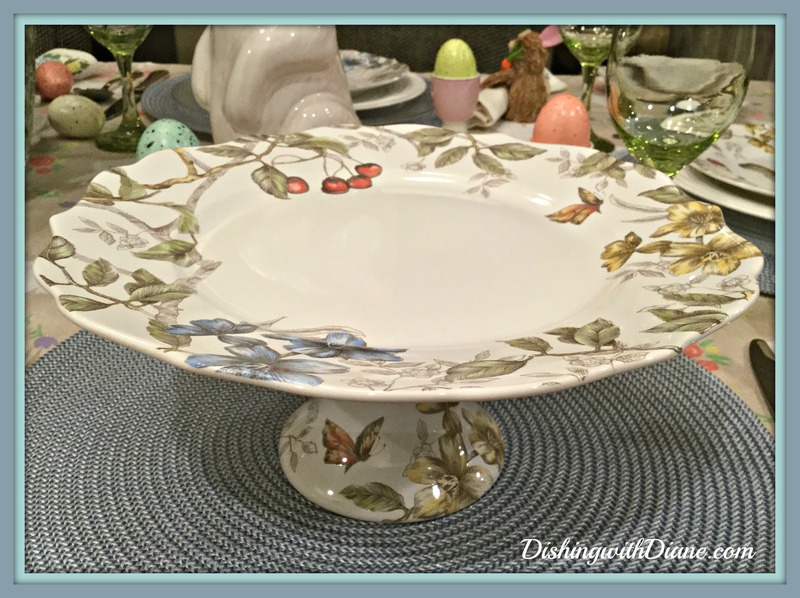 And that is my tablescape for Easter 2016. I hope you have a wonderful holiday and I wish you many blessings always. 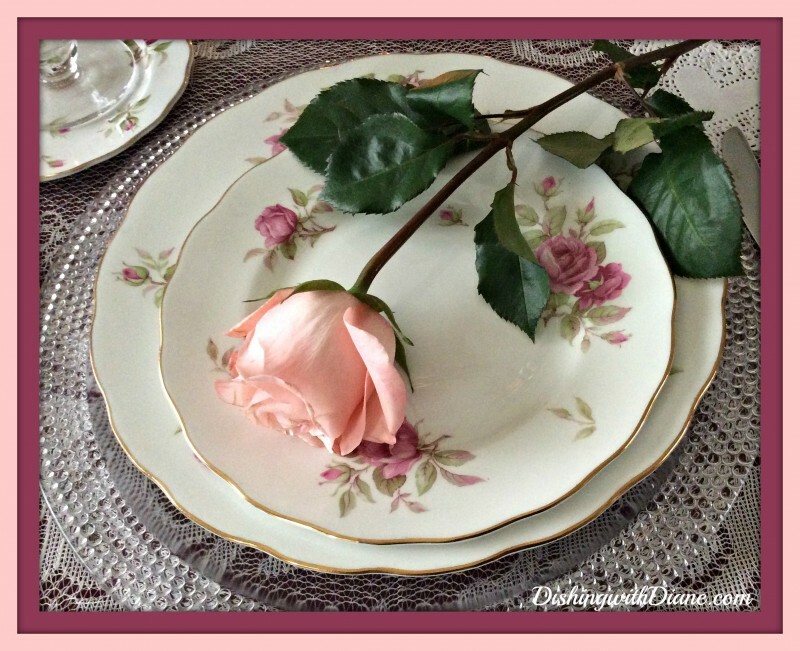 Please ask your family and friends to follow and share DishingwithDiane.com either on facebook or sign up for emails directly from the web page. And please continue to send me your comments, I love hearing from you. Note– Scroll to the top left hand corner of each picture for the white and red “pin it” button and add DishingwithDiane.com photos to your Pinterest page. The first pie is Pizza Dolce, (Italian sweet pie). It is an Italian cheesecake made with ricotta, eggs, milk, sugar and extracts. It is definitely not a low-calorie pie. Add eggs, milk and ricotta in a blender until smooth (I divide this to 1/3 at a time), transfer to a large bowl. When completed, add extracts, sugar, lemon zest and mix well. Spray two 9 ½ X 11 inch GLASS pans with Pam. Fill each pan ¾ of the way full—add rainbow confetti on top of mixture. Place in a 350-degree oven for approx. 1 ½ hours. (More sprinkles can be added during the cooking time). The second pie is Pizza Rustica and my absolute favorite. 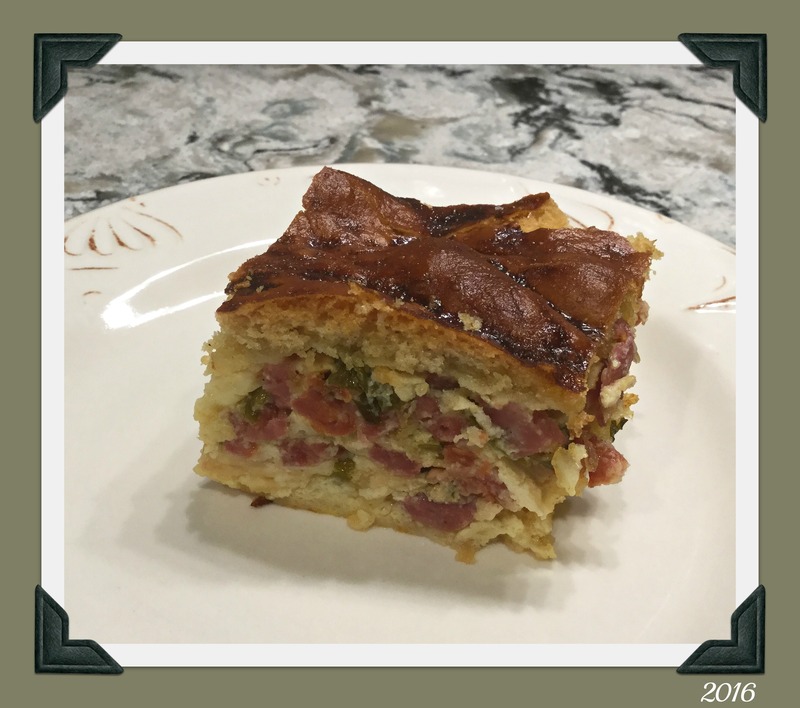 It is a classic Italian Easter pie made with cured Italian meats, Italian cheeses and bound together with eggs. We usually eat thin slices of Pizza Rustica as an antipasto before a traditional lamb dinner, and it can be served either warm or cold . This pie is also a main part of “Easter Monday” or “La Pasquetta” which means little Easter. Easter Monday is a national holiday in Italy. Italians leave the city and head to the country, the beach or the mountains for a family picnic. Pizza Rustica, frittata, Easter bread, wine and chocolate biscotti are all on the menu. The whole point is to celebrate the return of Spring. We always celebrated Easter Monday when I was a child. Depending on what region of Italy you are from, the name of this recipe may vary. It is also called Torta Pasqualina, Pizza Gaina and Pizza Piena . However, Easter is called Pasqua and Buona Pasqua means Happy Easter in Italy… no matter what region you are from! 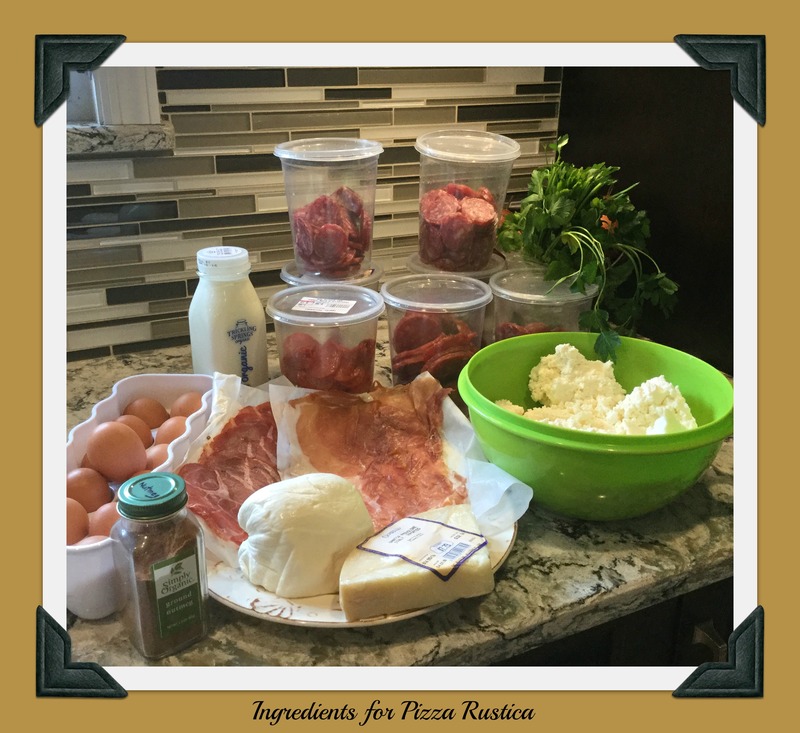 Cut first six ingredients (meat and cheese) into small bite size pieces & mix together in a large bowl (This prep work can be done on one day and assemble the pie the next day). Roll top & bottom layers of dough together around the sides to seal. Vent the top of the pie with a fork or paring knife several times. Add sugar to the EGG YOLKS and brush the top of the pie to prepare a glaze when cooking. 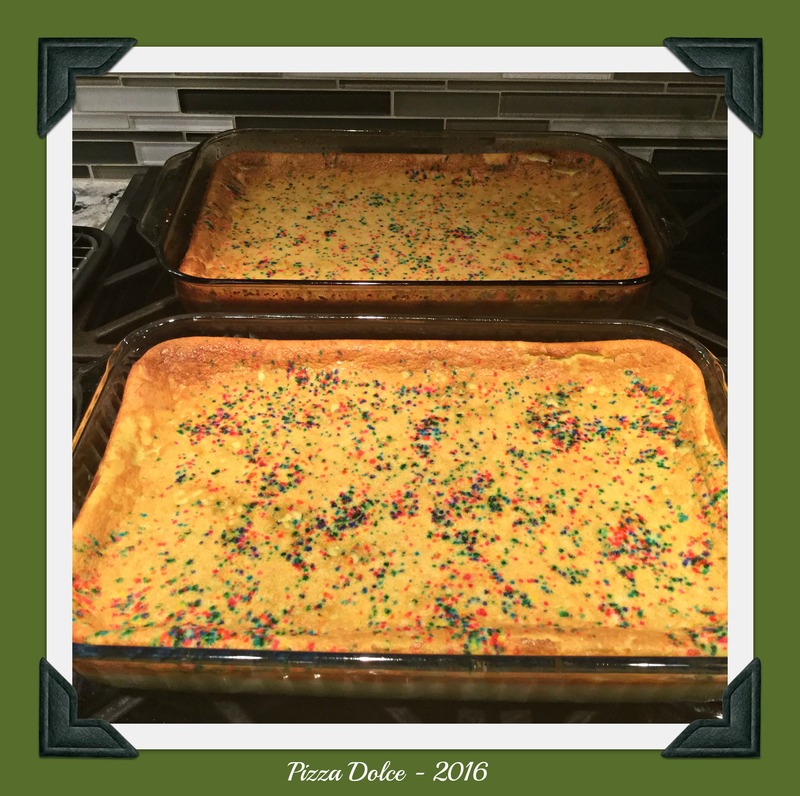 Bake at 350 for 1 hr to 1 hr /15 minutes…. For the first 30 minutes cover the pie with aluminum foil.For the remaining 45 minutes bake uncovered. 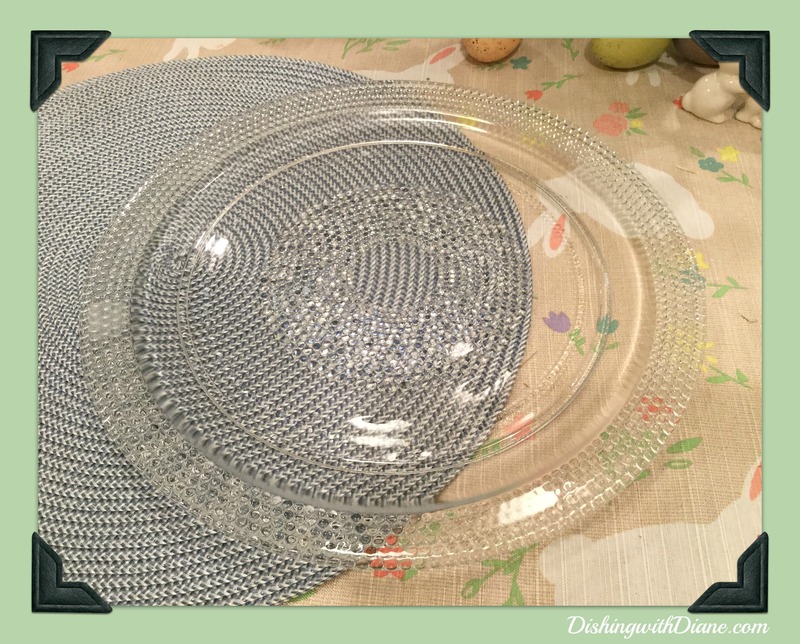 If using a spring-form pan-let pie stand 15 minutes –then release pan sides and transfer to plate. Can be served warm or cold. 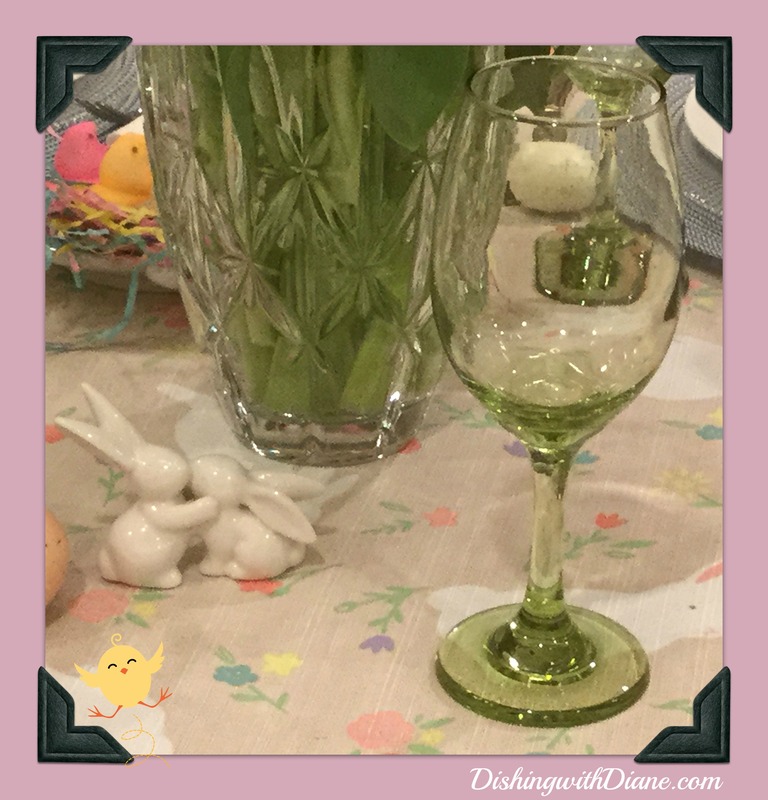 This entry was posted in Easter, Holiday Tablescapes, Recipes on March 27, 2016 by aries041158. Diane I just love all of your table settings! And of course all the beautiful food you make! Thank you. I am glad you are enjoying the blog. It’s a pleasure for me to write.